WEST NEW YORK, N.J. – The three candidates that comprise the “2016 Children First Team” are Adam Parkinson, Jose Alcantara, and David Morel. The candidates are long-time residents of the town of West New York and share over 50 years of living in town. Each bring a wealth of experience that add incredible value to the composition of the Board of Education. The three candidates have excelled academically and professionally, making their selections a no-brainer. The candidates represent the best characteristics of our community – youth, diversity, and passion – true role models our kids deserve. David Morel is a lifelong Hudson County resident with many years of experience in public service. He understands the challenges of growing up in our urban area and recognizes the value and impact that our public school system has on the lives of the children within our community. David was selected by the board to fill an unexpired term on the West New York Board of Education at the May 2016 meeting. David has a Bachelor of Arts in Business Administration from Montclair State University and has worked for the New Jersey Motor Vehicle Commission for many years. David is also a part-time Legislative Aide for our hometown Assemblywoman, Angelica Jimenez. 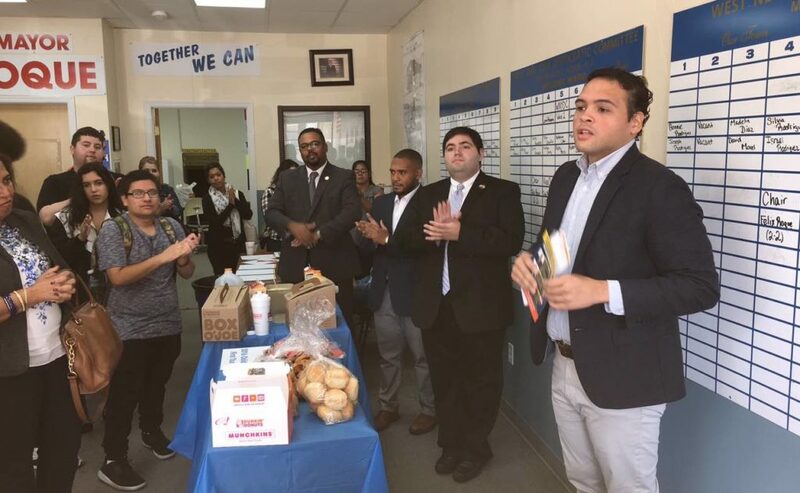 He also serves as a volunteer member of the West New York Zoning Board and is also an elected volunteer member of the West New York Democratic Municipal Committee. Born and bred in town and a proud product of our public schools, Jose attended PS #2 and graduated from PS #1 and Memorial High School, which he graduated in 2008. Jose went on to graduate from New Jersey City University with a Bachelor’s of Science in Criminal Justice, and is currently a Candidate for the Master of Public Administration degree at Saint Peter’s University. Jose is passionate about education and about ensuring that the community has a say in the progress of our town. Along with his full time studies, Jose Alcantara currently works in the Tax Assessors office for the Town of West New York. He led efforts as the cofounder of the organization responsible for ensuring that West New York has an elected school board. He has also been a member of the Planning Board of the Town of West New York for many years. Coming from a family of educators, Adam Parkinson knows the value of education in developing our communities’ children and stemming the tides of poverty. A 2013 Graduate of Memorial High School, and a lifetime member of the Memorial High School Alumni Association; he was the Valedictorian, graduating first in his class. Adam pursued his Bachelor of Arts in Elementary Education and American Studies from Saint Peter’s University, and is currently doing his student teaching in the Mathematics Department at Weehawken High School. He has served as Vice President of Kappa Delta Pi, the International Honor Society in Education and works as an Educational Facilitator at the Hudson Learning Center. Adam Parkinson has been a member of the West New York Board of Education for three years and has been the President of the school board since January 2016. He has served as Vice-President and as the board’s representative on the Hudson County School Board Association. Moreover, he has been recognized for his work by the South Jersey African American Chamber of Commerce, after being awarded their Urban School Boards Vice President Award, and the Excellence Award by Communitarian Media Network and Cambio Publications Group.